Arvada, CO—August 2018… Arvada began as a small town about seven miles northwest of Denver, less than six years before Colorado attained statehood in 1876. Incorporated in 1904, it once claimed the title of “Celery Capital of the World.” Today, Arvada is a thriving commuter suburb of 112,000 people. The Arvada Presbyterian Church goes back to Arvada’s early years, beginning in 1904 with a congregation of 14. Its current main building was dedicated in 1916, making it the second-oldest church building in Arvada. An education wing was added in 1952. As of 2016, the church boasted a congregation of 245 members. Services are mostly traditional and feature a 20- to 30-voice choir. During the summer, the choir takes a break, and three to five praise singers lead worship. An electronic keyboard and an assortment of microphones are obvious concessions to modern technology. But behind the scenes, a state-of-the-art Symetrix Prism 12x12 DSP manages the church’s sound system, offering auto-mixing with a simple user interface, with access to deeper features when needed. The flow of the sound system is fairly straightforward. The church has an assortment of handheld and lapel wireless microphones, the lectern mic, choir microphones (pencil condensers), and wired mics for the praise singers, plus the electronic keyboard. All told, the system uses about 20 audio channels, so the Symetrix Prism 12x12 is connected via Dante to a Symetrix xIn 12 analog input expander, for a total of 24 analog inputs, leaving room for growth. 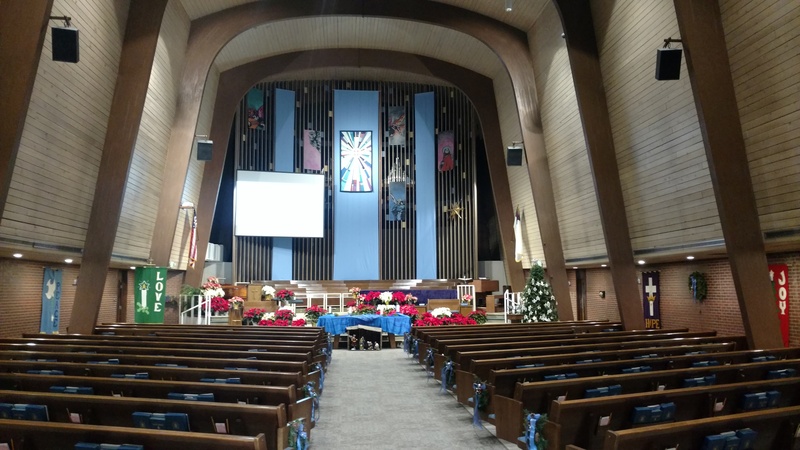 The Prism’s analog outputs feed the church’s older Crown and QSC amplifiers, which in turn drive QSC speakers in the sanctuary and Atlas in-ceiling speakers in the lobby.